We have a nice assortment of elegant carriages that were used by the prosperous gentry, sometimes known as the "carriage trade," and they are really delightful, but here on this page are our commercial vehicles. We also have agricultural horse-drawn implements that are fully-functional. 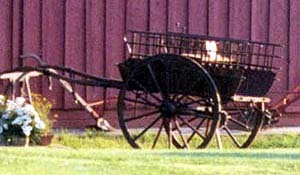 Bundoran Hitch Wagon, previously a commercial delivery van. 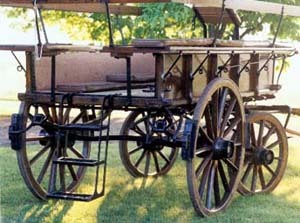 Today we use it - and the waggonette below - for carriage rides and picnics out on our pastures and hillsides. These massive and most impressive tradesmen's vehicles were used for delivery of trade goods and were often highly decorated to serve the additional purpose of advertising the tradesman's business enterprise. 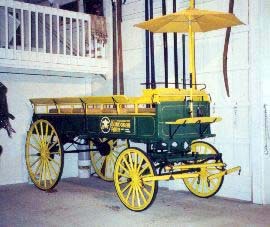 We used the Keg Wagon, most often with four horses, to promote the Bowman products, and the Faulconer Delivery Wagon promotes a hardware store. 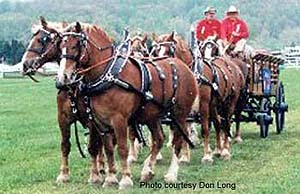 These vehicles were designed to be pulled by heavy draft horses, which had the power to move these extremely heavy loads. Rarely seen today, these big teams and wagons are truly impressive in a parade setting or in film production. a Jersey (Isle of) Van, routinely used in the 1890's to haul potatoes to the seaside docks in the Channel Islands. 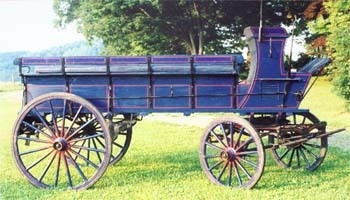 This van carries the fancy style of carriagework used by elegant coaching vehicles from England, and would have been owned by a prosperous farmer. Shown here with its holiday waggonette seats added. These were removable to turn the vehicle back into its workaday self on Mondays. 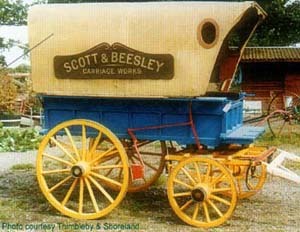 c.1890; English Delivery Van, used by tradesmen throughout England. Its heavy composition top kept out the English damp. And we are flexible if you are creative!! Perhaps you would enjoy having us hitch up a horse team for you as a part of a private reception for your friends at your place or at our carriage house, or driving to a picnic on a hillside like these? Contact our event managers to set it up; we'd love to be a part of your next big reception. Queen Marie Antoinette to the guillotine! or.. holding flowers at Jennifer and Greg Love's lovely post wedding reception. and a 1900 Irish Jaunting Car Typically Irish, this vehicle - made in Killarney - would carry four passengers, one driver, and luggage behind one heavy horse. 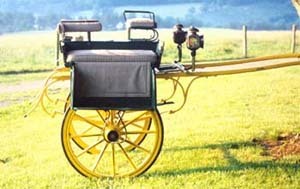 It was the Irish commercial taxi, and is sometimes called a "courting cart"
A very efficient use of horsepower. We can hitch one up for you. Book the Belgians and the Trade Vehicles.